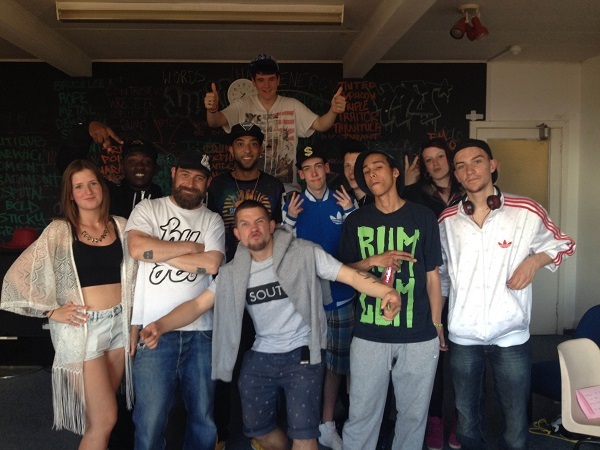 Brighton’s young rap movement were on point when BBC Radio 1xtra and Unique Productions dropped in to AudioActive’s Hip Hop Foundation recently. 1xtra’s DJ Target (Roll Deep) visited to find out more about our work as part of a documentary for his radio show ‘Big Brothers’. The documentary will take a look into the role that youth music organisations and mentors can play in supporting young and emerging artists into the industry. The team caught up with Rum Committee’s Gizmo and the man Rizzle Kicks call Sensei, Tom Hines, as well as a troop of up and coming emcees, at our Thursday night rap, writing & freestyle session.